Home ♦ Featured ♦ Mardi Gras in Las Vegas, what could go wrong? Mardi Gras in Las Vegas, what could go wrong? Forget Valentine’s Day or The Big Game, February is the month we dedicate to the best holiday of the year, Mardi Gras. It’s the best time of year to look at the sparkly green and purple beads among many other things that flash before your eyes. We know what you’re thinking, you think we are some random drunk uncle pervert from across the yard; but that’s not the case. We’re getting in the holiday spirit, and so should you. We might not get crazy like New Orleans, but as a sister party town, we feel it’s our duty to rage with them during this purple and green frenzy. It’s the last day before we try and give up alcohol for the 113th time for Lent. We’re trying people, what else do you want from us? Mardi Gras in Vegas 2018 is about to blast off, so let’s turn this city upside down with these things to do in Las Vegas. 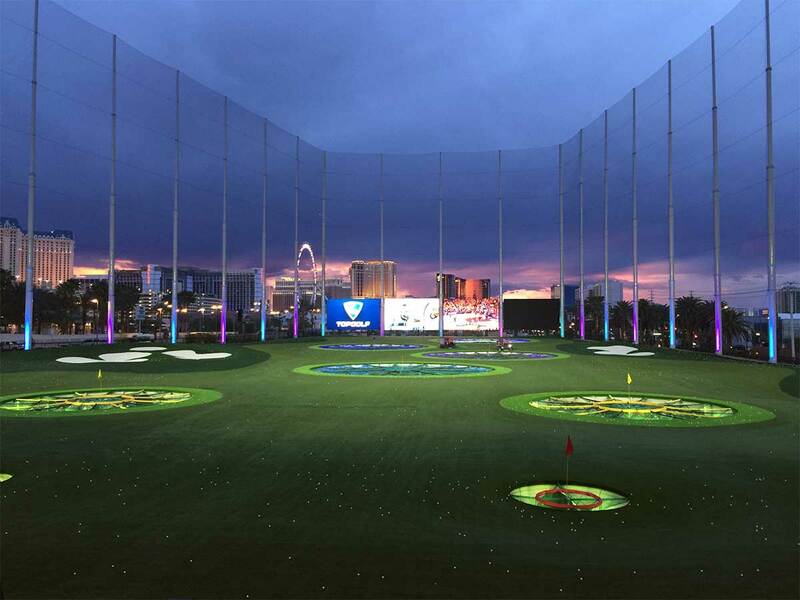 On Monday, February 12, Top Golf is hosting a Mardi Gras party with the help of MarchFourth. This circus-like-troupe will be entertaining guests with their kaleidoscope-like costumes and wild acts. They have stilt walkers, hoopers and Vaudeville-style dancers to get the party started while you’re hitting balls out onto the green. Most people find golf a very quiet sport, but not on this day. With the help of MarchFourth, the game as we know it is about to become ten times more fun. The only time you’ll be yelling “FOUR” is when you start swinging your clubs around, trying to start your own circus career. And if you whack yourself in the head, don’t worry you can crawl over to MGM Grand for the night and get some much-needed rest. Why wait for the week of Mardi Gras to come around? Let’s get this party started early and get a buzz going before it’s time to really throw down on Tuesday. 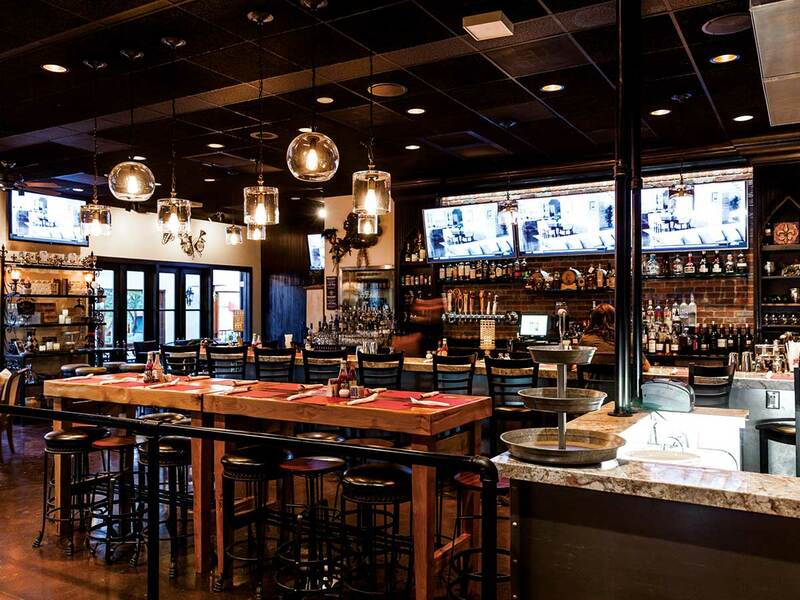 Therapy in downtown Las Vegas is bringing Bourbon St. to Sin City. You know, that famous street in New Orleans where people drunkenly stumble around? Yeah, that one. And in true honor of that great city, the bar is busting out a well-known cocktail called the “Hurricane.” It sounds exactly how it feels, so drink up; it’s time to give New Orleans, and the rest of the world, a run for their money. We want to be on that next level of extra when it comes to Fat Tuesday in Las Vegas. Instead of only experiencing the festivities, we want to TASTE the festivities. Like a wise man once said: “Don’t just eat the food, but smell the food, feel the food, BE the food.” Yeah, it sounds a little weird at first, but once you stuff your face with a King Cake from Freed’s Bakery, your insides will turn purple and green to really get in the spirit, so technically you will become the food. No, not really, but the idea of that happening sounds cool. 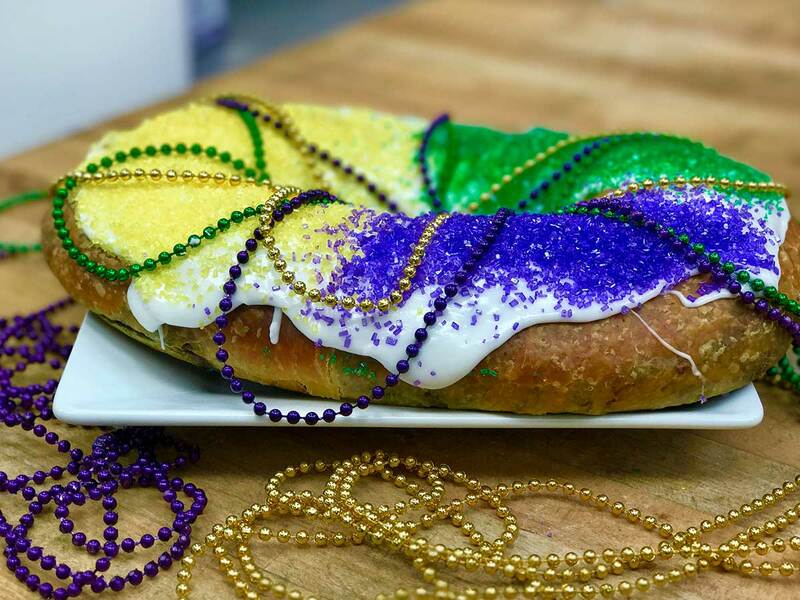 So, for $26.95 get ready to consume the green, purple and gold cake that’s topped with beads to truly make it Mardi Gras style. Oh, and don’t eat the plastic baby placed inside; that’s for good luck, not your belly. Get ready for hurricane season, and we’re not talking about the tropical storm. Now, you might be wondering, “are they drunk?” Not yet. But we will be after we chug a few of these yummy concoctions. 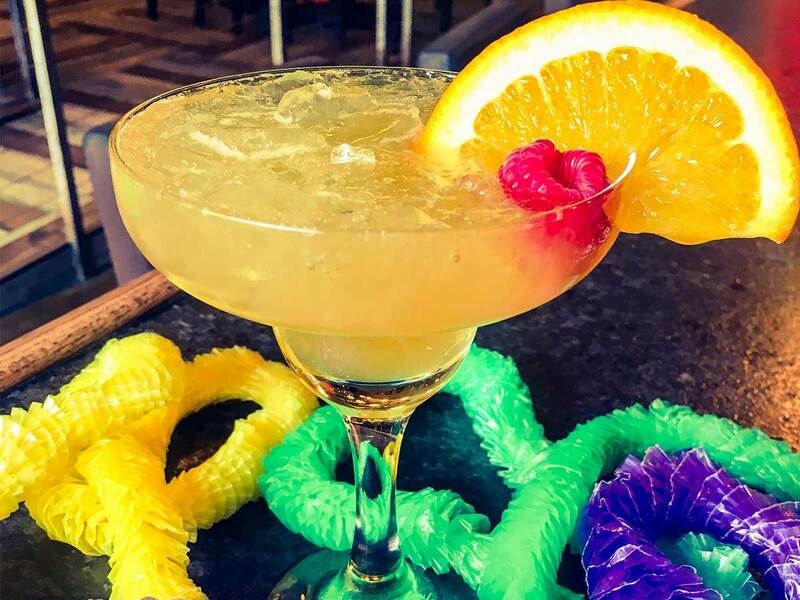 In celebration of Fat Tuesday and Mardi Gras, Beer Park at Paris is hosting one big storm of a party and we’re going to be in the middle of it. But, if that’s too much for you, head to the edge of the patio and take in the Bellagio Fountains. With a little wind, and the gusto of the blasts of water, the fountains will cool you off with a little splash. Drink up people, it’s time to create our own storm. 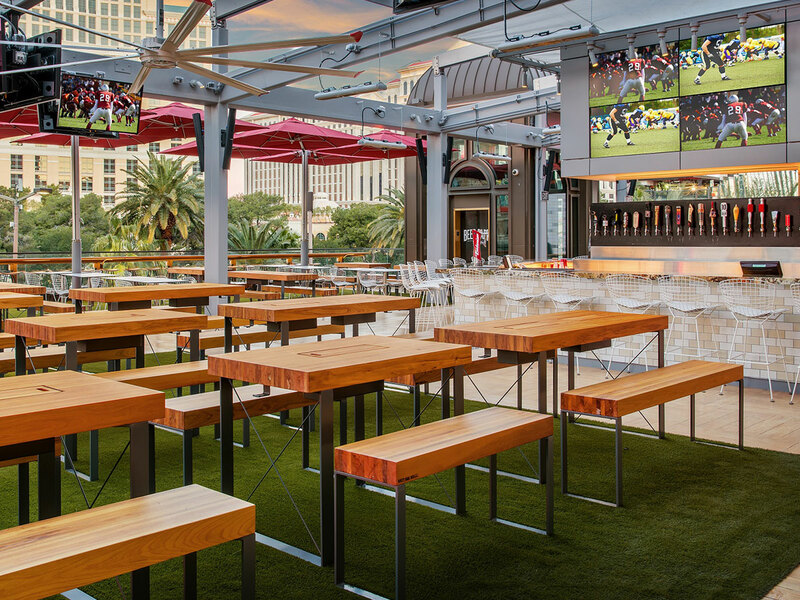 Lola’s in downtown Las Vegas and Summerlin (the bougie west side of town) brings a little bit of the bayou to us. And this Mardi Gras we’re going to celebrate by eating great creole and cajun food, listening to a live jazz band and having a party. Their flavor combos explode in your mouth with every bite and their crawfish is something straight outta the mud. If you told us that we had to eat the whole menu to save our family, we would eat it twice without even thinking. So don’t threaten us with a good time, because we’ll rise to the occasion for Mardi Gras. And since we’ve been talking about food so much, excuse us while we dive into their blackened catfish and grits.